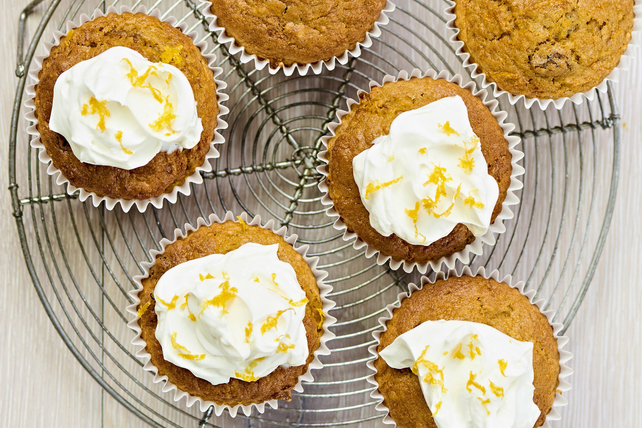 Blanketed with creamy frosting, these flavour-packed cupcake treats are sure to be a hit with family and friends alike. Prepare cake batter as directed on package. Add dry pudding mix; beat 2 min. Spoon into 24 paper-lined muffin pans. Bake 20 to 22 min. or until toothpick inserted in centres comes out clean. Cool 10 min. Remove from pans to wire racks; cool completely. Beat cream cheese and butter in large bowl with mixer until blended. Gradually beat in icing sugar until well blended. Add vanilla; mix well. Spread onto cupcakes. Use a 1/4-cup measuring cup or small ice cream scoop to easily portion the cake batter into the prepared muffin cups.